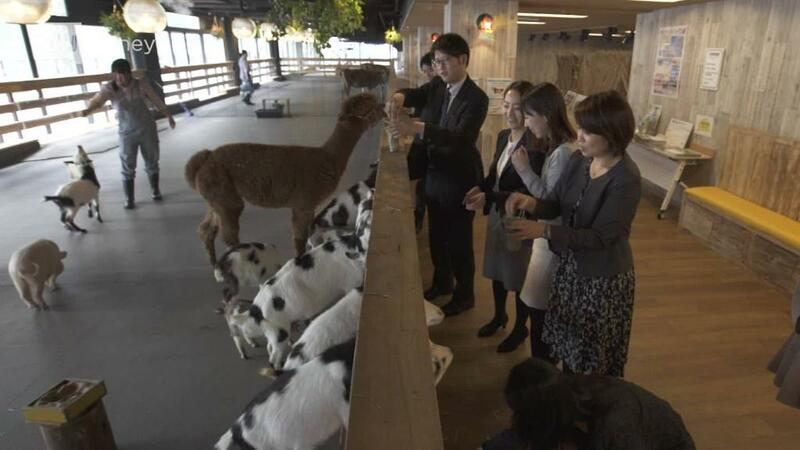 Could future offices be homes for farm animals? Work can be stressful: running from meeting to meeting, juggling deadlines, dealing with rude customers or callous bosses and a never-ending string of emails. There comes a point when it becomes too much. That's when you experience burnout. Our bodies are equipped to handle stress in short bursts, explained Dr. David Ballard, the head of American Psychological Association's Center for Organizational Excellence. "Burnout is when we experience that stress over an extended period of time." The impact of burnout is very real: lack of motivation, decreased job confidence and performance, increased moodiness and negative thinking, all of which which can lead to a lower quality of life in and outside of the office. Related: Are you a workaholic? "Sometimes it can interfere with problem solving, decision making, interpersonal relationships with peers and colleagues as well as family and friends," said Ballard. Here's what to watch for — and what to do about burnout when it hits. Employees who have little control over their schedules, interactions and time management are at risk of burning out. Having inflexible structures and policies can leave workers feeling trapped, experts warned. What to do about it: Look for ways to add more control to your daily schedule. Taking 10-15 minutes each morning to outline a few goals to accomplish can help regain a sense of control, recommended Joe Robinson, a workplace balance expert. But the battle against burnout falls on both companies and workers, and employers need to acknowledge their role in worker burnout, experts said. "Recognizing that your employees should have some autonomy on things like how they handle a situation can help prevent burnout," said Alicia Grandey, a professor of industrial-organizational psychology at Penn State. The perception of unfairness in the workplace — whether it's feeling slighted, unfairly targeted or overlooked, or inadequately compensated — can also contribute to workplace burnout. An employer's lack of communication and transparency with decisions can also be a drag on employee morale. All those negative feelings can really start to fester. What to do about it: Identify the problems and deal with them head on. For instance, if you think you're being paid unfairly or being passed over for promotions, bring it up with your boss and discuss the issue. "As an employee, you need to make sure you are doing your part and making your voice heard and expressing your voice and opinions," recommended Ballard. Supervisors should aim to be transparent with workers about decisions. "Be open and honest with communication and give reasonable explanations for decisions and motivations," he said. When you're not at work, you need to disconnect ... for real. Thinking about work outside of the office and even on your day off is a major burnout indicator. Companies can also offer workshops, experts and other resources that can help workers cope, said Blake Ashforth, a professor at the W. P. Carey School of Business at Arizona State University. The resources don't have to be overly formal or expensive. Ashforth pointed to a social services company that had weekly group meetings to allow employees to talk about their week, problems and seek advice. "Even if people couldn't help, you had a sympathetic ear." Your body gives you many signs it's under stress: neck tightening, headaches, stomach pains. If those feelings are accompanying negative thoughts about your job, you could be burning out. "You can barely drag yourself to work every day, and then the work you used to love, you cant stand the thought of it," said Robinson. What to do about it: Get more sleep. This can be easier said than done since anxiety and stress can keep you up. But adequate rest is essential to getting your body back on track. "You need good quality sleep to help return to your baseline and recharge and get back to work functioning at pre-stress levels," said Ballard. Getting burned out often leads to moodiness, negative thoughts and a lack of motivation in the office. "Ultimately, it can affect your job performance by making it harder to getting things done," said Ballard. A forced positive attitude is common in the workplace. And some people — particularly service workers — have to put on a happy face and suppress their real emotions on the job. What to do about it: Taking up a hobby, a new dance class, volunteering or learning new skills can help reduce and distract from an overwhelming workplace. "This infuses you with positive emotions and they crowd out the negative," said Robinson. Seconding guessing your abilities, disconnecting with clients and colleagues and slowing productivity can also indicate burnout. Some people lose confidence in their ability to do their job and disengage. What to do about it: Get a reality check, advised Ballard. "Check in with colleagues, supervisors or trusted friends and family about your performance," he said. Setting reasonable goals can also help regain confidence, he added. "Focus on a set of small achievable goals to turn you back in the right direction."